It’s almost three years since Bleu and Victoria first met. Victoria was seven years old and Bleu was 16 weeks old. And, although Victoria was afraid of dogs and Bleu was afraid of everything new, when they met it was love at first sight. Since that first meeting, they have met almost every week to play and learn from each other. It is everyone’s hope that these play dates will boost Victoria’s confidence, and when she is sixteen years old, she will get her own dog – Leader Dog! When Can My Puppy Start Agility Training? I get many calls asking me how old a puppy needs be to start agility training. My answer is “if your puppy is under the age of one he most likely can start PRE-agility training right now, but training that includes, repetitive behaviors, jumping and contact equipment needs to wait until the puppy is older.” Starting a puppy too young can permanently damage its joints. Puppies have soft bones, and unclosed growth plates. Exercise that is not appropriate for a puppy’s age can cause substantial and permanent damage. What are growth plates and why do they matter? Growth plates are soft areas that sit at the ends of the long bones in puppies and young dogs. They contain rapidly dividing cells that allow bones to become longer. Growth plates gradually thin as the puppy approaches puberty which signals the growth plates to close (normally by 18 months). The only way to positively know if your pup’s growth plates are closed is by x-ray. Until the growth plates are closed, they are vulnerable to injury. In addition, a puppy’s muscles and tendons are stronger that his growth plates. When performing a repetitive behavior, like jumping, if the puppy “lands wrong” and twists its leg, instead of incurring a simple sprain, the puppy’s soft tissue can pull apart his growth plate. Injuries to a puppy’s growth plate may not heal properly resulting in a shortened or misshapen limb and possibly make the puppy prone to more injuries when he grows up. Puppies have soft bones! Like people, a puppy’s bones aren’t fully grown until after puberty. Repetitive behaviors, landing hard after a jump or when descending a piece of contact equipment (dogwalk, A-frame, teeter) could result in a fractured front leg. Spiral fractures are common in puppies and 50% of all fractures happen to puppies under the age of one. Any exercise that puts pressure or twists a puppy’s leg puts it at risk for fracture. Flat-work (pre-agility) There are a ton of things that you and your puppy can work on before he ever gets on any equipment, and you can start when your puppy is as young as eight weeks. Work on attention, targeting, tug games, running through jump uprights. Use ground poles: straight line and grids, teach collection and extension. Introduce your puppy to lessons that teach body awareness: agility ladder, box work, walking over low bars on the ground, wobble board, Budja board. Play retrieves and sending to a target can teach your puppy distance. If you know handling skills work on those without equipment: front cross, rear cross agility heeling. Play with your puppy and build a strong relationship. Don’t forget: Attention. 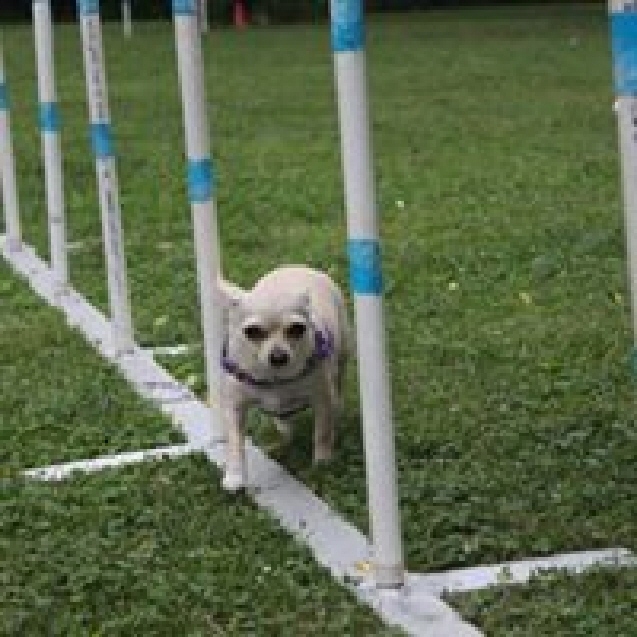 The list of things to do to prepare your puppy for a long agility career is endless. Keep in mind that puppies don’t have the same endurance as an adult dog. Keep any training/play session short. Give your puppy ample time to rest throughout the day. Puppies grow up fast – enjoy each day and keep your puppy safe from injury. I have known border collies and Australian shepherds that have had long healthy lives enjoying the sport of agility into their teens. Setting your puppy off on the right paw will do the same for him. My nephew has this automatically added to his emails & it made me think about dog training this week when I communicated with him about a family visit. It may be because of a minor conflict one student’s dog just had. It might be because I’m trying to get my nosework students prepared for upcoming nosework trials. Maybe it’s because I’m working hard on making sure my dog and I are prepared for our first higher level nosework trial this fall. Whatever the reason, I wanted to write about this concept…be a thinker! Whatever you do with your dog, please take the time to think ahead of time. Dogs LEARN every day! Dogs LEARN every minute they are with us! Does your dog want to go outside? Think about how this can be an easy training time giving the dog what he wants! I use dog giving me attention before he goes outside but it could be a sit. I just got up from my chair & walked to the door to give my dog what he wanted. So why shouldn’t he give me something I want? Something we need to practice for freestyle and rally competitions = attention with him looking at me! But for you, this could be a sit so your dog doesn’t rush the door trying to get out before you open it. I keep a journal as regularly as possible because I also compete in rally, freestyle, rally-free, and nosework. When I write in my journal what I wanted to do, what I accomplished, and what was successful that day, I also write out things that I should work on the next time I train. I try to THINK ahead! I challenge you to also think ahead. No matter what you do with your dog. 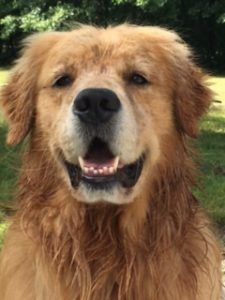 How can you add some brief connection with your dog so that your dog is the best dog ever – for you, for your family, for competing?! Think about when you take your dog for a walk. Think about when you take your dog for a ride. Think about feeding time. By adding one little training moment with your dog, you can add so much value to what you want from your dog – even if it’s a better connection between the 2 of you! Think ahead also for what you might encounter on a walk or going for a ride. How can you prepare to help your dog be the dog you want during these times? Take some treats in your pocket for a walk so you can reward your dog for making the right choices & walking on a loose leash or not visiting with a dog you pass if you want him to walk on. Take some poop bags in case on a ride, your dog decides he has to potty. Treats will come in handy when your dog is on leash. Poop bags will make you a more responsible dog owner! Enjoy your time with your dog….but think about your time! SO BE A THINKER – NOT A STINKER! Years ago, when I started my dog training journey, the only method of teaching was aversive or punishment based. I had trained several dogs using these methods, and I had moderate success in the obedience ring. Then came Brava. She was a blue merle Australian shepherd. I thought of her as being a bit stubborn, hard headed and hard to train. With lots of effort we made it through Novice (the first level of obedience showing). But, now it was on to Open and more difficult exercises. The “retrieve” which is done “on the flat” – throw the dumbbell, the dog goes to get it and returns the dumbbell to her handler’s hand and “over a high jump” – the same exercise but the dog must jump over a jump on the way to get the dumbbell and jump it again when she returns with the dumbbell). This is the exercise that rocked my world and changed everything I knew about dog training. The way I attempted to teach Brava the retrieve was done by using the principles of negative punishment – a forced retrieve also known as an ear pinch. The way it was always taught. The first step is to show your dog the dumbbell and pinch your dog’s ear. This is supposed to cause pain, and your dog yelps. As soon as your dog’s mouth open, you put the dumbbell in her mouth, simultaneously releasing the ear pinch. Theoretically, when the dumbbell is placed in your dog’s mouth, the pain goes away (because the ear pinched is released too). In reality, this is what happened to me and Brava: I showed Brava the dumbbell; I pinched Brava’s ear; She clenched her teeth tight; She did not yelp; She did not scream; She did not open her mouth. The harder I pinched, the tighter she shut her mouth. To say the least, the ear pinch did not work. What the ear pinch DID accomplish was to make Brava afraid of the dumbbell and afraid of me. When she saw me with the dumbbell, in my hand, she would go the opposite direction and hide. Believe me, the ear pinch wasn’t the only aversive training I did with Brava. She wore a choke chain and on occasion a pinch collar. I would frequently jerk/choke to get her into position or stop her from pulling. If she jumped on me I would step on her paws. I may have even rolled her over on her back. It’s a wonder that she never bit me! Luckily, I found a new trainer who introduced Brava and me to the world of positive motivational training. It took lots of work, lots of praise, lots of cookies, lots of time and lots of love to gain back all the trust I had lost by using punishment. 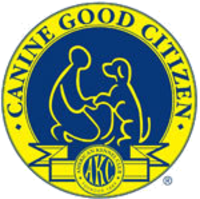 Brava earned her American Kennel Club, Canadian Kennel Club and Australian Shepherd Club of America Utility titles (at that time the highest title that could be earned). And, yes, she had to do lots of retrieves. She was ranked in the top ten in all three organizations. Brava lived to be sixteen years of age, and when it was time to say, “Goodbye,” I promised Brava that I would never knowingly hurt another dog. I have kept that promise, and I intend to keep it forever, whether I am training my dog, or teaching students how to train their dogs. Aversive/painful methods are no longer a part of my training. I Promise!